Thérèse L. Provenzano | Rolling Acres Farm No. 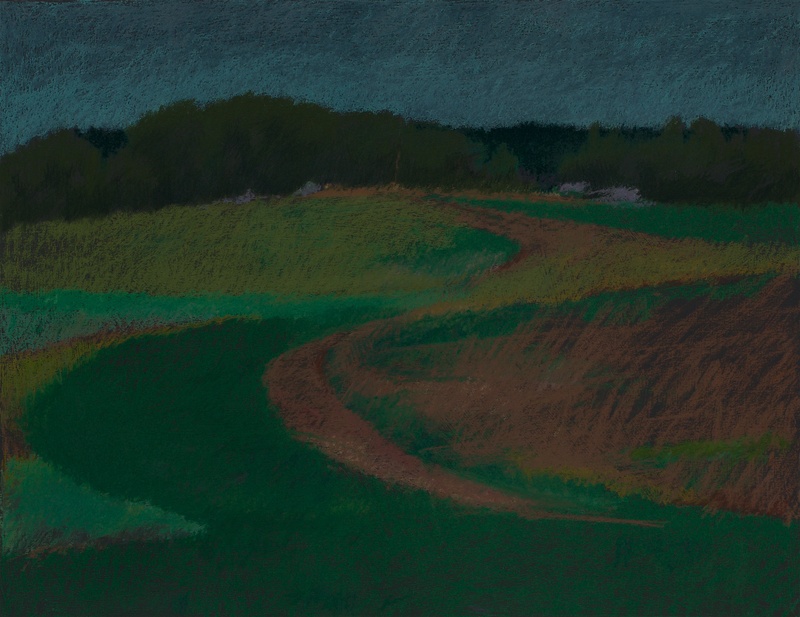 1, What About Green | Pastel on prepared ground/paper | 26.75" X 32.5"
Thérèse L. Provenzano | Rolling Acres Farm No. 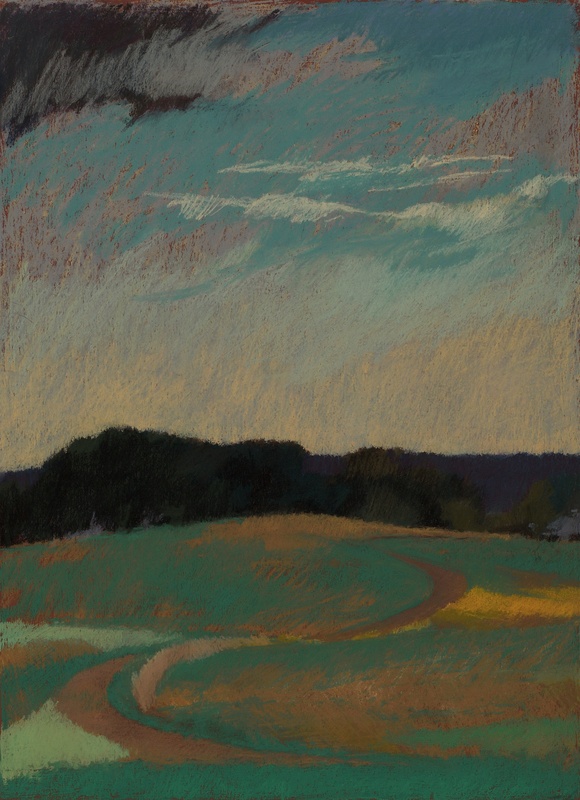 2, Two Curves, Meander and Sit | Pastel on prepared ground/paper | 31" X 24.5"
Thérèse L. Provenzano | Rolling Acres Farm No. 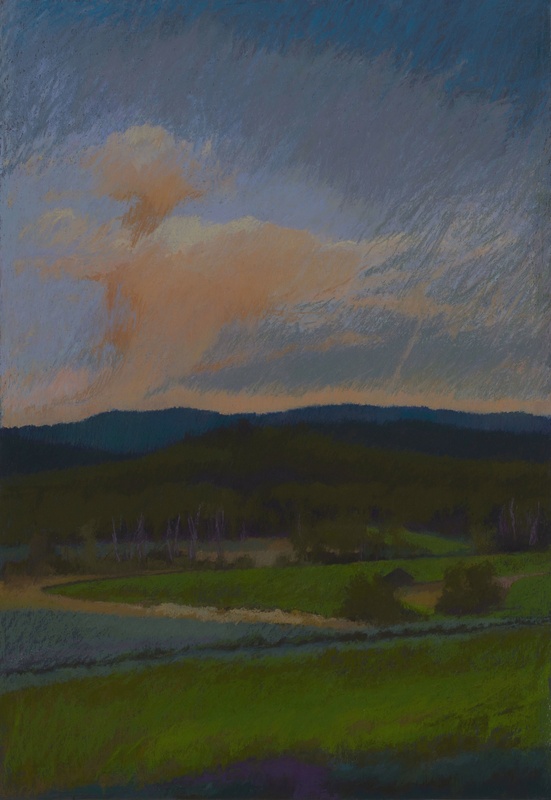 3, After the Rain, Violet Haze | Pastel on prepared ground/paper | 23.25" X 20.5"
Thérèse L. Provenzano | Rolling Acres Farm No. 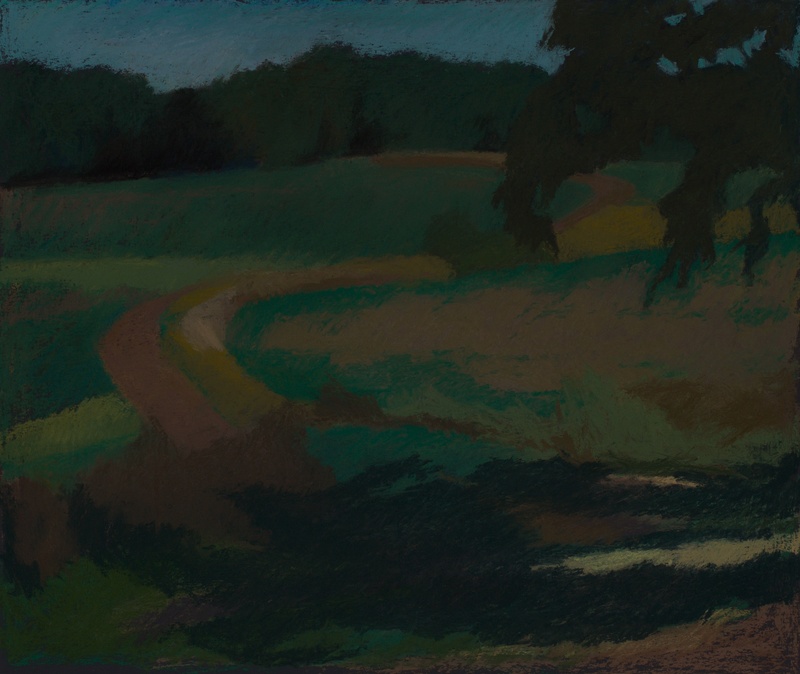 4, Before the Storm, Early Evening Shadows | Pastel on prepared ground/paper | 30" X 27.5"
Thérèse L. Provenzano | Rolling Acres Farm No 5, Black Oak Canopy, Hoovers | Pastel on prepared ground/paper | 23.25" X 20.5"
Thérèse L. Provenzano | Buckwheat No. 1- Curved, anchored | pastel on paper | 21" X 28"
Thérèse L. Provenzano | Buckwheat No. 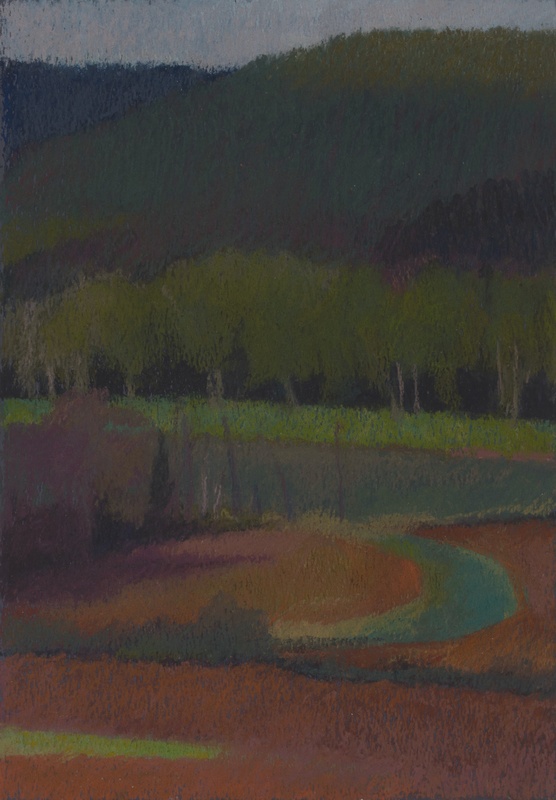 2- Hooked, diversion ditch, red and green | pastel on paper | 16" X 14"
Thérèse L. Provenzano | Buckwheat No. 4- Three Darks, upright | pastel on paper | 24" X 24.5"
Thérèse L. Provenzano | Buckwheat No. 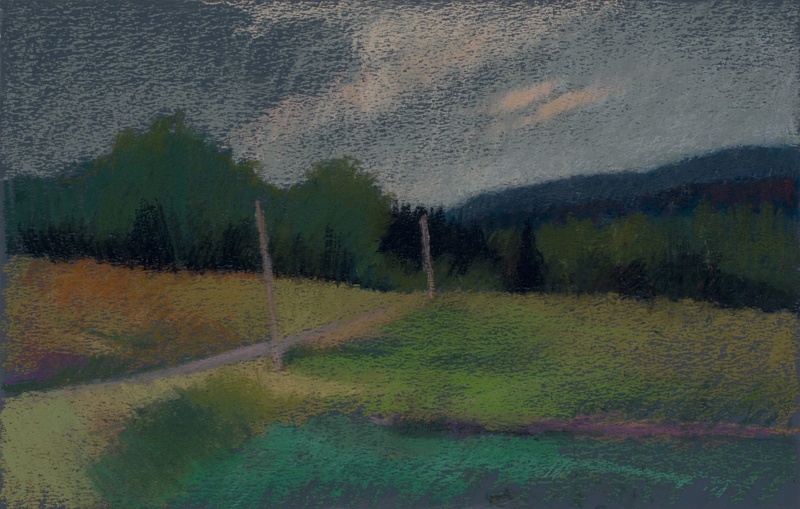 6- Two Poles, leaning | pastel on paper | 15" X 20"
Thérèse L. Provenzano | Buckwheat No. 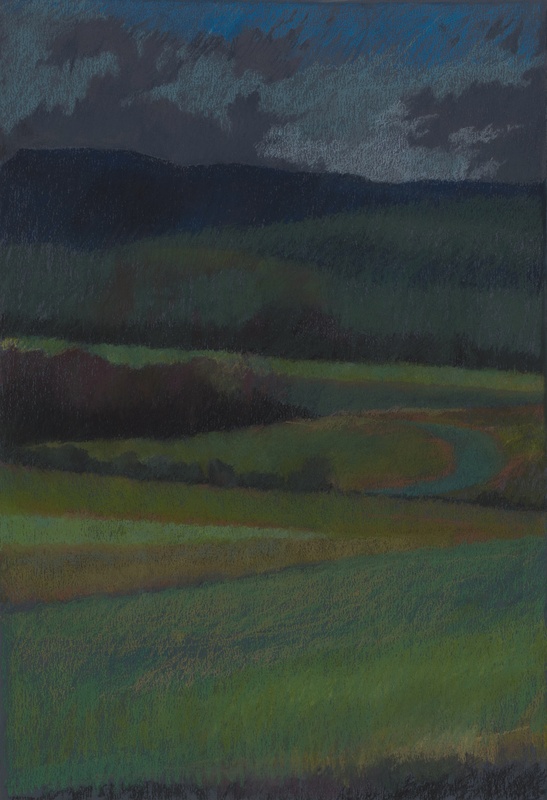 5- Mellowed Green, after | pastel on paper | 17" X 21"
Thérèse L. Provenzano | Buckwheat No. 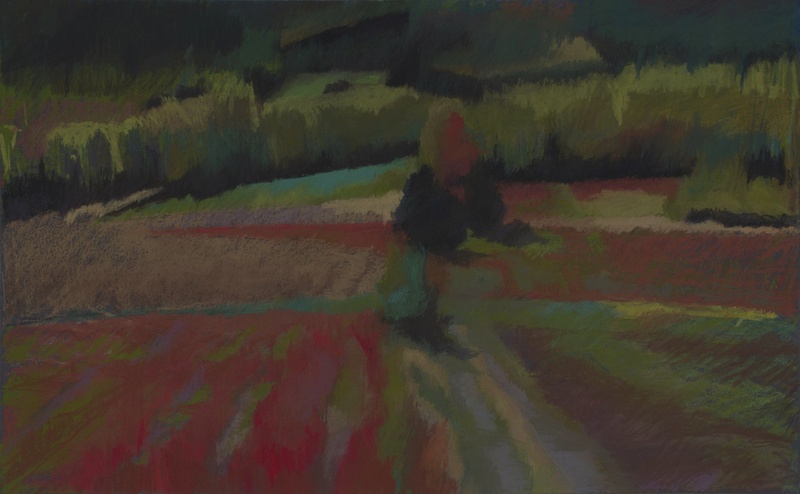 9- It Can Be Divided, red and green | pastel on paper | 21" X 29"
Thérèse L. Provenzano | Buckwheat No. 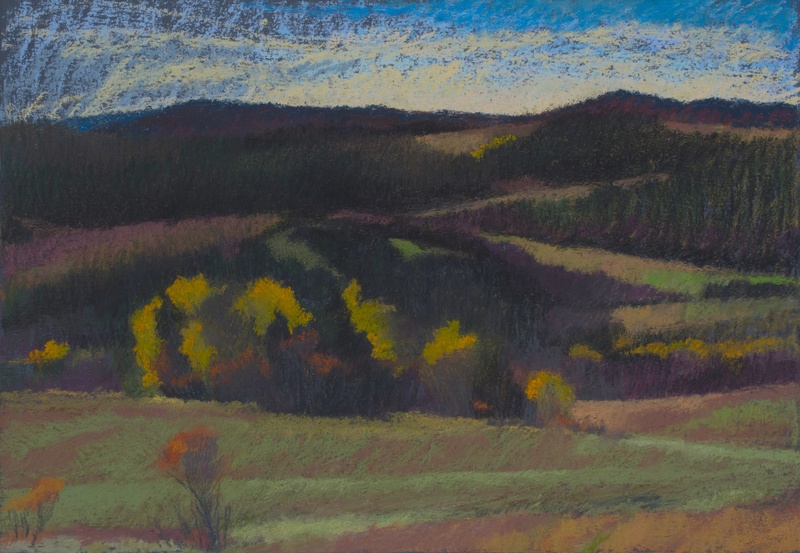 10- Just About Half, late afternoon | pastel on paper | 21" X 21"
Thérèse L. Provenzano | Buckwheat No. 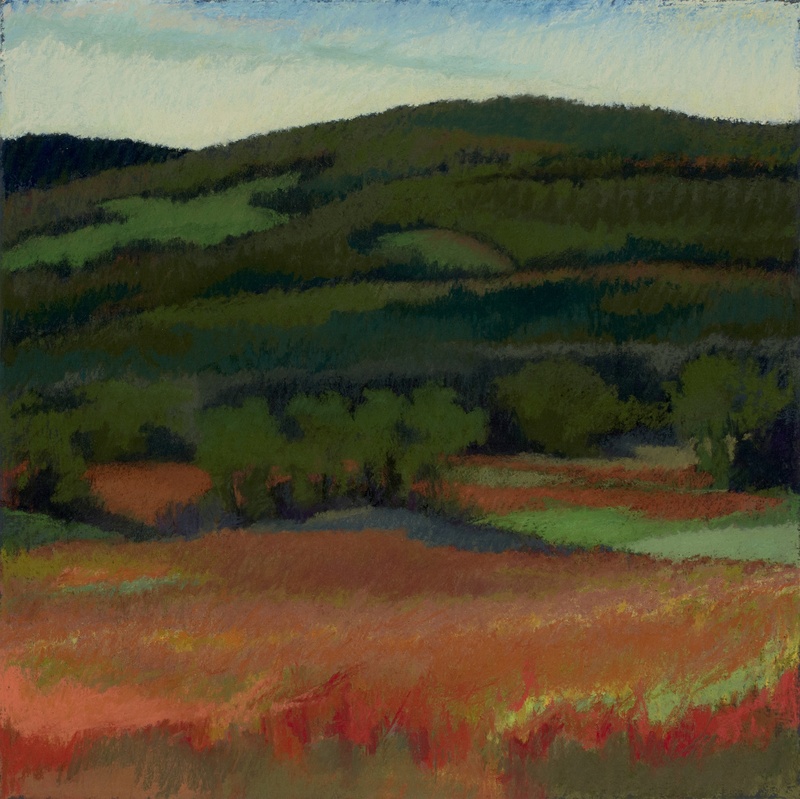 12- The Twang Shall Meet, purple and orange | pastel on paper | 22" X 22"
Thérèse L. Provenzano | Buckwheat No. 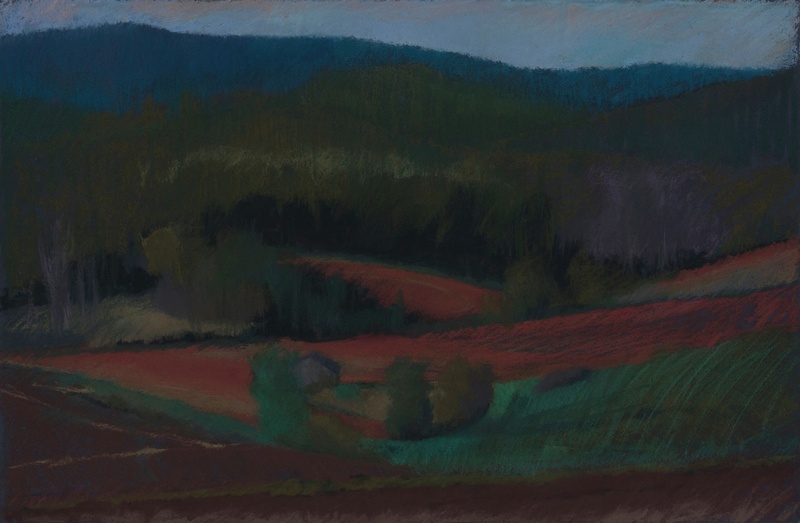 13- Zigzag, diversion ditch, green and blue | pastel on paper | 32" X 24"
Thérèse L. Provenzano | Buckwheat No. 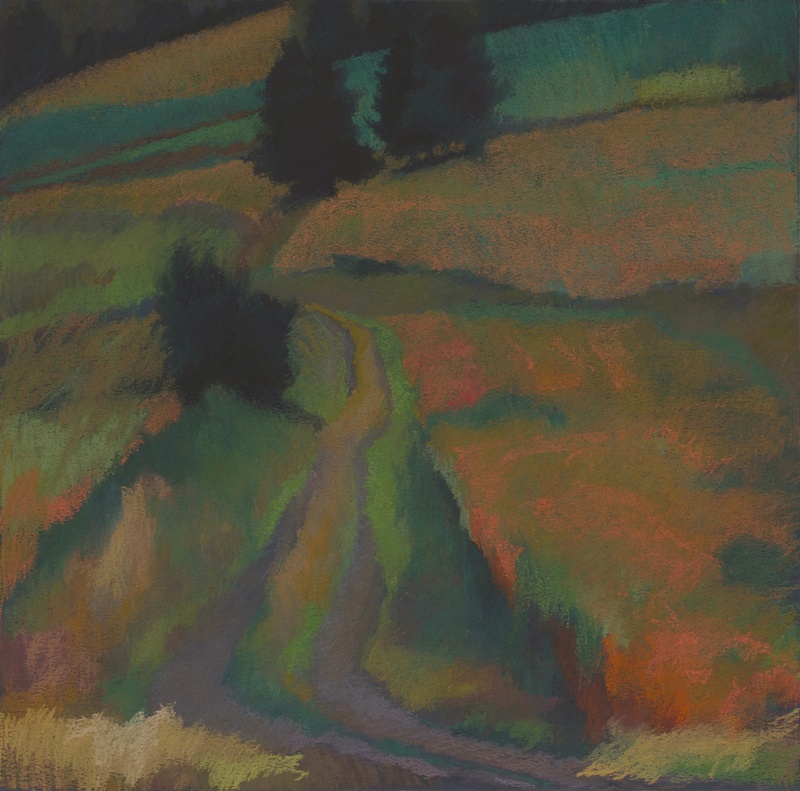 14- Imposing on Lush Green | pastel on paper | 32" X 24"
Buckwheat Each day is different. There lies the challenge. What's given is different. What I see is different. Mostly, the light changed. Secondly, the field changed. Patient and with intent, I search for one constant and rest my gaze on a shape that is familiar. It grounds me to trust my instincts. I take off, willingly. I found myself in a place of wanting to paint Bouchard's red that glistened. I identify land with my grandfather. He was a farmer of Wallagrass. "This happened. Three Septembers ago, I saw a red that glistened when buckwheat had just been harvested. 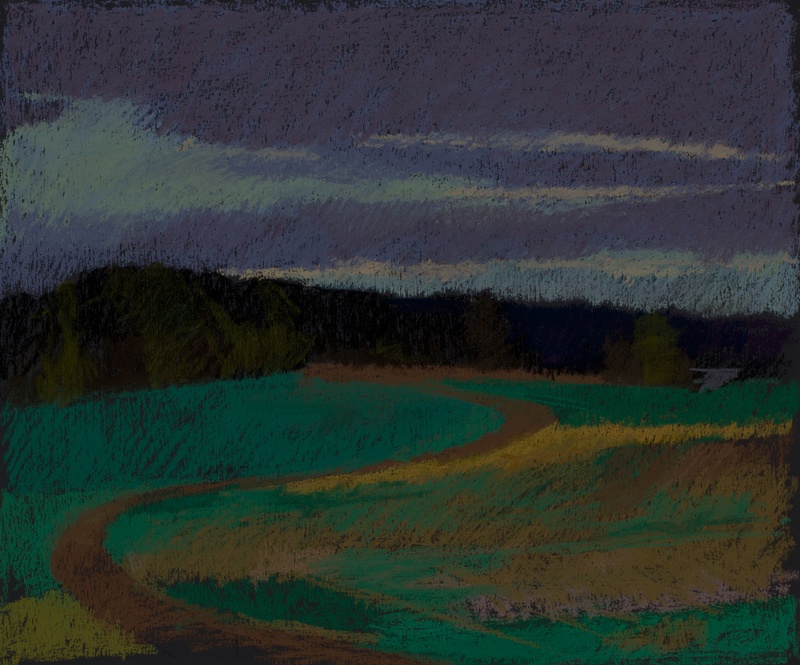 I had to have it along with a safe site to park my vehicle, unload my gear and set up painting en plein air. 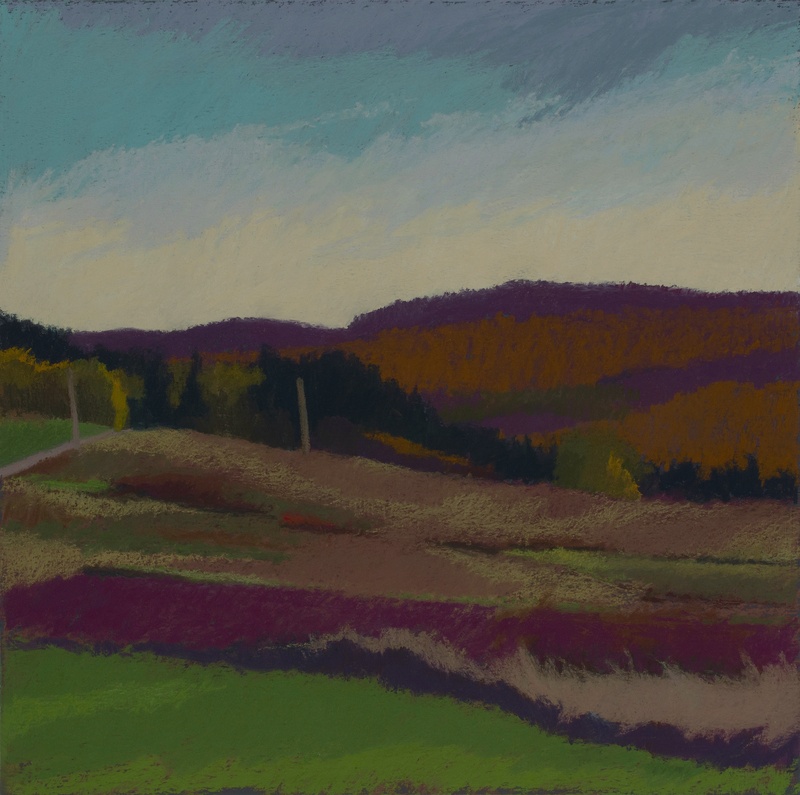 If you wondered about the green vehicle, large white umbrella and easel set up on top of the hill at Wallagrass Scenic View, it was I. Painting the landscape en plein air, has its daily surprises and challenges. The land hardly ever looks the same as you left it. The field grows and as it does the color changes. I have seen it run a gamut of greens, to soft then deep burnt sienna, then salmon or yellow with red. Cloudy days and a cloudless sky brought the longest steady light. Partly sunny days brought an ever-changing light that produced ever-changing shapes. I first read Rainer Maria Rilke's Letters to A Young Poet during my undergraduate studies at Philadelphia College of Art, now known as University of the Arts. Rilke wrote, "Everything away is infinitely far…Go into yourself and see how deep the place is from which your life flows…For the creator must be a world for himself and must find everything in himself and in Nature, to whom his whole life is devoted… Being an artist means, not numbering and counting, but ripening like a tree, which doesn't force its sap, and stands confidently in the storms of spring, not afraid that afterward summer may not come. It does come…your solitude will be a support and home for you, even in the midst of very unfamiliar circumstances, and from it you will find all your paths." Rilke's words rang true when I confronted and sometimes wrestled with painting Bouchard's buckwheat en plein air. 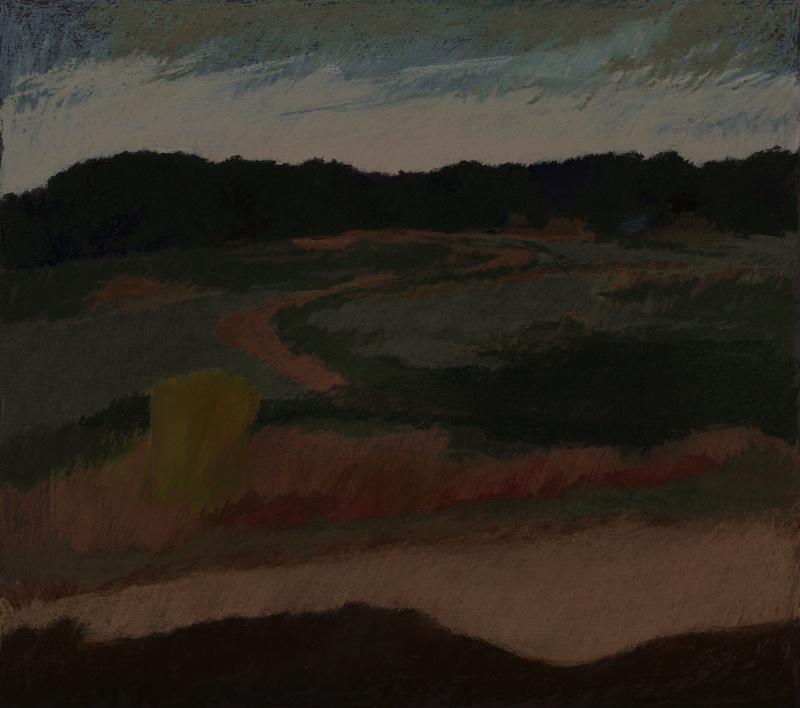 A direct and unfiltered experience with nature was essential to my process as the distant fields pulled me close. There were days in which I didn't want to stop painting, pack, load up and leave. The setting sun and cold wind commanded the end of a day's work. It required a flashlight in hand."